Over the Hill and Through the Woods to the Amusement Park we Go. Last weekend our local Six Flags opened. My husband and I had previously decided that we would not have season passes this year, but somehow we had a membership to the Amusement Park and well, since they charge us for a month we might as well go. Besides, we can cancel any time we want. After reevaluating the situation we decided that a month of six flags equated to eating out twice. 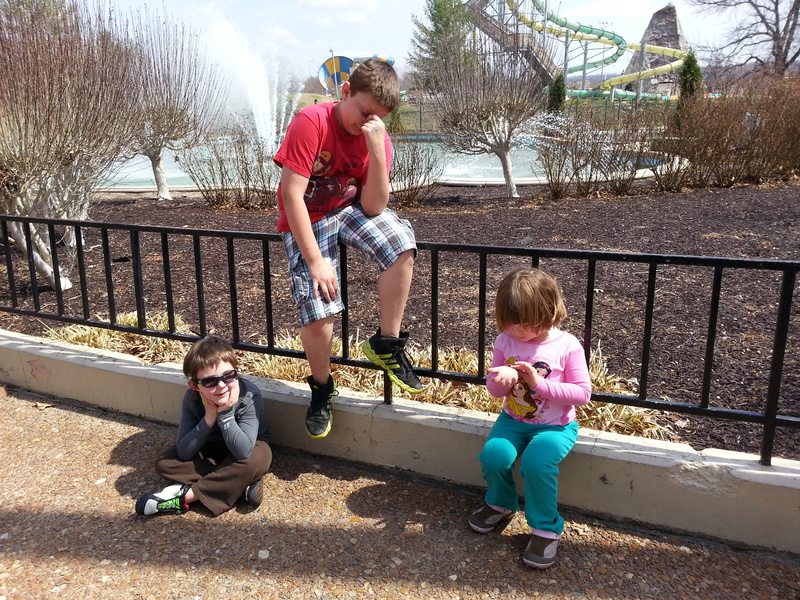 Yeah, no brainer – we are not eating out AT ALL for the summer and going to Six Flags instead. Add that we are only 5 miles away from Six Flags and you can see the benefits to having a membership. Besides that, amusement park rides are a great trick in our bag of sensory diet activities. This morning I packed the kiddos up in the car, and headed for the park. After standing in line for an hour waiting to replace Dee’s lost card (I’m so glad that I am a pack rat sometimes and don’t let go of things. Instead of throwing away last years cards after the season was over I kept them for memorabilia, this saved us $40 for replacement cards). 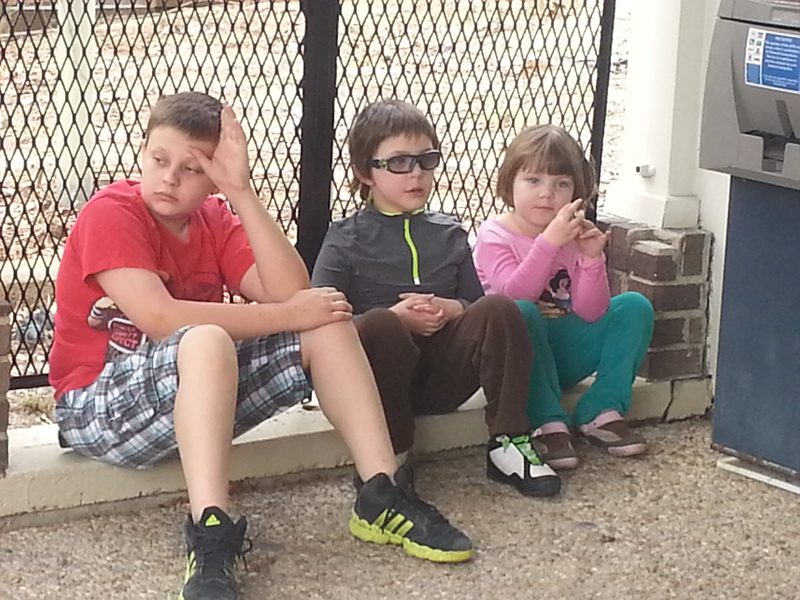 I truly marveled at how patient my children waited. Towards the end of our wait I worried as the kids became more antsy. I expected a meltdown from Chase, instead he began to rock back and forth, one of his coping mechanisms and stayed calm. What a difference from last year. Can we go in yet????? I’m bored!!!! The first thing my kiddos do when we enter the park is race to the stack of maps. “I want my own map!” Emma yells. “Nooooo, I want MY own map.” Chase responds. On to the next ride, a favorite of the entire family. Well, except for Emma. Last year she didn’t quite reach the height mark. Chase clapped his hands in excitement today when she exceeded the mark by a quarter of an inch. We all got to go, and Emma enjoyed her first roller coaster. 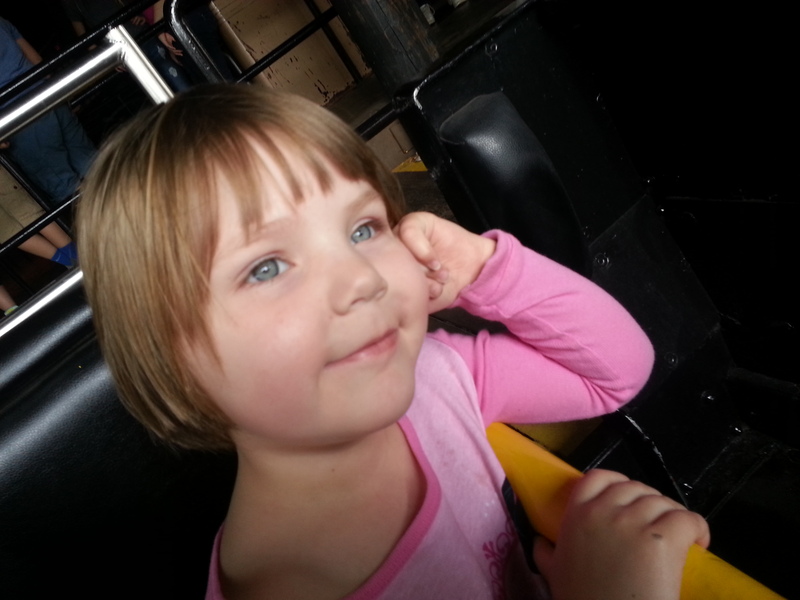 She loved her first roller coaster ride, “The Mine Train” she giggled the entire ride. This is Emma’s content look, taken after the ride ended. We headed to our third ride, and were met with hostility for the first time when handing over our “Equal Access Pass”. I have read peoples comments about parents of kids with Autism thinking they are entitled to special treatment. I don’t think my son is entitled to special treatment. I just want to alleviate some of his daily discomfort. My son has a hard time standing in lines surrounded by people. The noise, the jostling, having to stand in a confined space cause an immense sense of discomfort for my son. When asked to stand in lines he ends up in other peoples personal space, often pushing into them. He often elopes, sending me into a tizzy – I hate it when I can’t see him. Thankfully I had his brother with me to help keep an extra set of eyes out. When he gets over stimulated in a line he also has meltdowns which can shatter your eardrums, and if we are on stairs climbing up well, your safety as well as Chase’s are in jeopardy. (just love the death stares we get over those). In this case Chase had to walk up a set of stairs to the exit of the ride, the Screaming Eagle roller coaster. I always love the comments, “You’re going to wrong way.” “Hey, lady this is the exit.” Blah, blah. I know. Chase tries to walk on the right side, but his balance is always off kilter and he ends up brushing into almost every single person. We go up the stairs and the space becomes even more confined, and more bodies file past my son. He is now directly in the way of exiting coaster riders. “Excuse me.” This lady says. He just stands there looking up at her with this look. I try to verbally ask Chase to move over and try to guide him using both hands to move him over to the right. He stands resolute. Not moving. She’s where he wants to be, and no amount of gentle physical force from me is going to move him. The lady repeats, “Excuse me, I need to get by you.” At which point she grabs my sons arms and moves him. She goes down and before I have a chance to address her rudeness I am met by my son at the beginning of a sensory meltdown. He does not like strangers touching him without permission – which is weird because he will go up to strangers and ask for hugs all the time, but it has to be him who initiates. “That’s it, I don’t want to go on this ride. Lets go home. I’m taking all of our choices away. No more rides.” He makes this sweeping motion with his hands (he’d make a great umpire – SAFE) and stomps his foot. Big tears start rolling down his face. I had missed the signs earlier that he was reaching his daily limit. We were only on our third ride, but had already been at the park for well over three hours. While I am trying to calm Chase down I hand the “Immediate Board” over to Dee. Dee hands it to an employee coming up behind us, witnessing Chase’s meltdown. He takes the pass over to the supervisor. “You’ll need to wait a couple of turns. There have been quite a few immediate boards back to back and well, people have been waiting a long time to get on the ride.” I totally get that. I don’t say anything. The supervisor continues explaining this too me as the second group of people are leaving the roller coaster and pushing past my son. I am doing all I can to keep him physically over to the right hand side. Some guy walking past makes a comment about how the park shouldn’t let people get on the ride at the exit. At which point the supervisor makes another comment to me, “You know, everyone over there had to wait in line to get on the roller coaster. They don’t have an immediate board like you do.” At this point my feathers are a bit ruffled. Sometimes I have distorted thoughts and I admit that I was probably having them at this point. I saw what appeared to be a condescending look on his face, the tone in which he used and I really felt like he was being rather snide. They don’t have a waiting area with lots of space that will keep people from pressing up against my son. They don’t have a separate entrance for handicap riders. If I had a magic bubble that we could zap Chase into for the duration of the wait we would be awesome. That and well, some rides are particular favorites and he rides them over and over again. (Thank goodness this wasn’t one of them or I would have left in tears, I almost did anyways). I keep trying to tell the kid (yeah, the supervisor is a young kid probably in his late teens early, early 20’s) that it isn’t the wait that is the problem, it is the people walking by my son that is the reason for the immediate board. I tried explaining this to the supervisor, and finish my explanation saying “I understand that people have been waiting to take this ride. My son just struggles with all of the people filing past him while we are waiting.” His last comment to me before he walks away, “Well, after the next group of people get off the ride that won’t be a problem for him anymore.” Really, Really! Chase melts down again as the next group exits the ride. I give him a hug to try and help him regulate. At this point I’m not even sure if he will make it onto the roller coaster. Dee walked onto the platform and Chase broke free from my hug chasing after him. “Do you want to ride it again?” Please say no, please say no I silently plea. AWESOME – he hasn’t been hungry all day. I try to take one last picture as we leave the park and am met with staunch resistance by all. We leave the park. I get them lunch. We get home and Chase crashes on my bed waiting for seconds. This is the first picture I took. I wanted a better one with all of them looking at me. The second I asked everyone to look at me Chase turned his head and looked the other way. 30 some odd pictures later all pictures had the back of his head. Well I should have stopped at the first one. Although we had a couple of blips in our day the majority of it met with success. It was a good run, and next visit will be even smoother. I know to get to the Screaming Eagle first, before the lines get long. I know to pack a lunch and have it in the car. I know to bring sun screen (we are all sporting sunburns). And last but not least, water bottles!!!!!! *Chase sat on the couch as I read this to my husband. I like having Scott preview my posts before I hit PUBLISH. Chase giggled each time I said “Chase” and he said, “No mommy, I’m *****. You’re talking about me, *****.” Chase has given permission to share this story.